Well past the days of postseason heroics, Bucky Dent was released from the Texas Rangers on April 2, 1984. Later in the season, he signed a contract with the Yankees, where he became a household name years earlier. Finding himself released from a contract with the Yankees shortly after, without appearing in a MLB game, Bucky signed with the Kansas City Royals. Appearing in eleven games, mostly as a defensive replacement at shortstop and third base, Bucky was able to manage three hits and one RBI between August and September in the 1984 season. 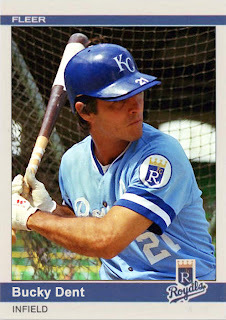 After the 1984 season, Bucky was released from his contract with the Royals and his MLB playing career ended. 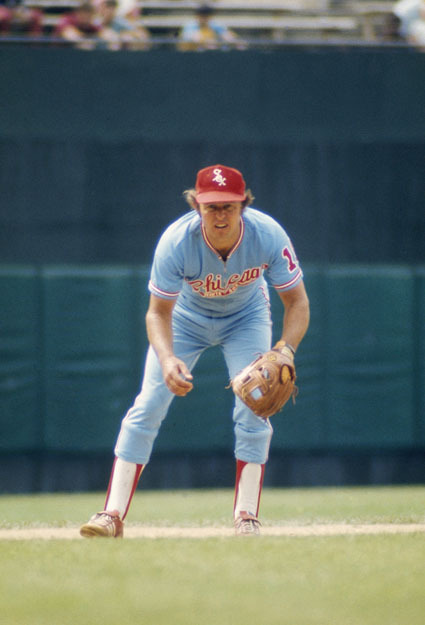 Dent ended his career with the team his Yankees defeated two years in a row to advance to the World Series, in 1977 and 1978. The Royals bested the Yankee team he was on in 1980, to advance to the World Series. The Royals did win the Western Division in 1984, but lost to the Tigers in the playoffs. Dent did not participate in any of those games. 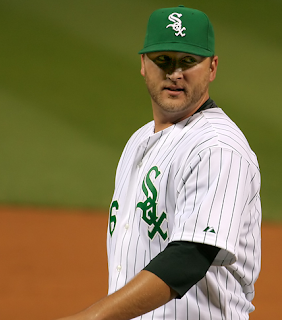 In fact, his last game was on September 11, 1984 against the Twins. Bucky came in as a defensive replacement in the sixth inning for John Wathan, who pinch hit for Buddy Biancalana. Dent was lifted in the eighth by pinch hitter Leon Roberts, who was replaced in the field by Onix Concepcion. I've thoroughly enjoyed your time in Chicago. We (as the collective of players and fans) have experienced the best of times and times that were probably best forgotten. Yet, your calm, cool and grace always poked through. There are too many highlights that I will remember from your time here to start listing them all. I'm sad to see you go, but I can understand your decision. And I thought St. Louis was the only team that could wrangle you away from the White Sox! I'll still collect your cards and I will follow your career with great interest. I, and the rest of Chicago, will sure miss you. We will never forget you. I could say a lot about the Hall of Fame committee's vote, but I won't. Instead, I'll say congratulations to the ghost of Ron Santo and his loyal supporters. I've said it before, and I'll say it again... Ron Santo, the player, deserves to get into the Hall of Fame, as do other excellent players that repeatedly get overlooked. 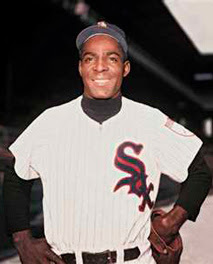 For a great read on why Minnie Minoso got the shaft again, read Jim Margalus' excellent article.